Excess loose skin and fat in the upper arms from weight loss or aging can be removed in a procedure called an arm lift or brachioplasty. 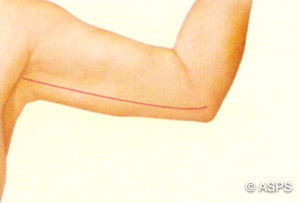 Depending on the amount of skin to be removed, an incision is made in the armpit (for minimal skin laxity), or along the inner aspect of the arm (most commonly). 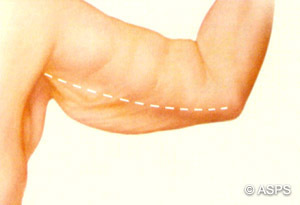 The excess skin is lifted until the amount that can be safely removed is determined. The skin is then closed with sutures and a compression wrap or garment is applied. For those with deposits of excess fat in the upper arms, liposuction may be used to permanently remove fat and improve contour.